Despite having the largest warchest in Texas politics, Attorney General Greg Abbott, the Republican nominee for governor, keeps adding to it with a series of fundraisers scheduled into at least mid-October. He’s already piled up more money in the bank than any politician in modern Texas electoral history, but that’s not good enough for Attorney General Greg Abbott. The Republican candidate for governor is still amassing campaign cash — and in the process he’s exhibiting plenty of confidence that Texas will remain in GOP hands come November. Cal Jillson, a political scientist at Southern Methodist University, said the hefty fundraising schedule shows Abbott is already looking past the 2014 race and has begun gathering funds for future political battles. In the last two weeks alone, Abbott has put together at least seven fundraisers, including one that will be held at the home of energy executive Neil Leibman and his wife Amy on Wednesday night in Houston, with country singer Pat Green providing the entertainment. He’ll hold at least seven more fundraisers by the middle of next month. Abbott campaign spokesman Matt Hirsch said the campaign is focusing solely on the current race and cited the hefty cost of TV advertising in Texas, which is home to three of the 10 largest cities in the country. Experts say it takes as much as $2 million a week to saturate the airwaves in Texas. While Davis has certainly continued to fundraise, her campaign said she's prioritizing public events where she can connect with voters. Petkanas provided a list of at least 100 public events and press availabilities held since July 1, not including several appearances to promote her recently released memoir. Abbott’s campaign provided a list showing about 30 such events over the same time period, though 19 of them required a payment or some type of membership credentials to enter. Abbott does have a major public outing scheduled for Wednesday — a press conference to announce his plans for keeping Texans healthy. And on Friday, Sept. 19, he'll square off with Davis in a televised debate, followed by a few meet-and-greet events in the Rio Grande Valley the next day. Those public events are being sandwiched between a couple of private fundraisers. A week after Wednesday's Houston fundraiser, Abbott will hit up donors in Lubbock. Then on Sept. 23, he will appear at the Star Ranch golf club for a fundraiser hosted by Austin real estate developer Tim Timmerman and others. A day later he’ll travel to Midland for a fundraiser at the home of businessman Dan Hord. Then it’s off to Beaumont for a fundrasier on Oct. 6, and another one the next day in Fort Worth at the home of philanthropists John and Nancy Snyder, the Abbott campaign confirmed. A day after that, Austin-born Carly Fiorina, the former Hewlett Packard CEO who ran for the U.S. Senate in California in 2010, will headline an Abbott fundraiser at the Four Seasons Hotel in Austin. And a week later — sniffing distance from the Nov. 4 election — the attorney general will be appear at a fundraiser in San Antonio hosted by billionaire Red McCombs and his wife Charline. At the end of June, Abbott had $35.6 million in the bank, the largest cash-on-hand figure ever reported by a candidate for Texas elective office. Davis had about $9 million under her exclusive control and another $3 million or so piled up in an account she splits 50-50 with the Democratic turnout group Battleground Texas. The next fundraising reports are due in early October. Petkanas, the Davis spokesman, said the Fort Worth senator has enough money to get the job done. Disclosure: Red and Charline McCombs are major donors to The Texas Tribune. Southern Methodist University is a corporate sponsor of The Texas Tribune. A complete list of Texas Tribune donors and sponsors can be viewed here. 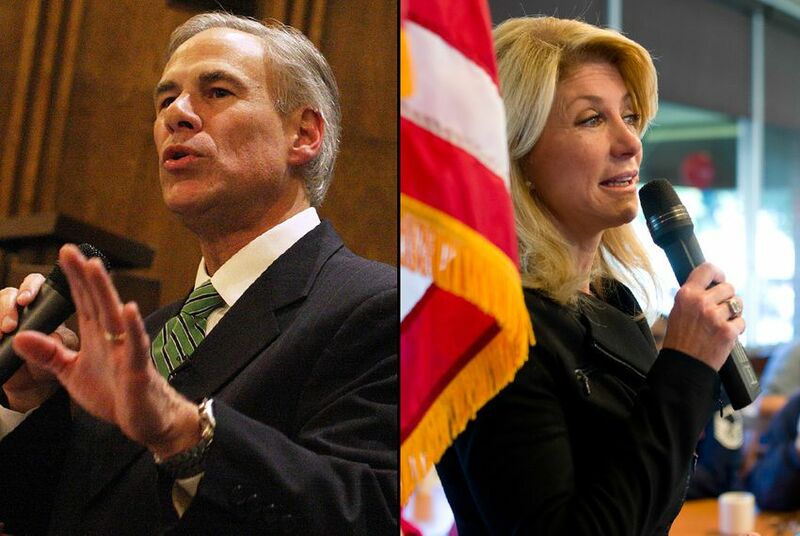 Editor's note: An earlier version of this story said that Greg Abbott and Wendy Davis will take place in a debate on Sept. 20. The debate will be held on Sept. 19.